With the 70th International Air Transport Association Annual General Meeting now just days away, Breaking Travel News here takes a look back at the 2013 event in Cape Town. Top of the agenda last year were concerns about emissions, with the IATA AGM unanimously backing a call for an emissions market to offset growth in their greenhouse gases after 2020. The move was hailed as a landmark effort to address the environmental impact of the industry. Willie Walsh, chief executive, International Consolidated Airlines Group, said that it was "vitally important" to send a strong message that "we are an industry determined to address environmental performance, determined to continue to show leadership and determined to play our part in shaping a fair and equitable solution to this global problem". Qatar Airways chief Akbar Al Baker also strongly backed the move for a collective push by the aviation industry to tackle climate change, a theme we can expect to hear more on this year in Doha. IATA"™s endorsement of a market-based tool to cut pollution is hailed as a significant contribution by the private sector. The post-2020 program would set the market"™s emissions baseline at the average of greenhouse-gas output in the three years through 2020, IATA said. At the end of the 2013 event IATA also confirmed Richard Anderson, chief executive of Delta Air Lines, would assumed duties as chairman of the IATA Board of Governors. Anderson succeeded Alan Joyce, chief executive of Qantas Airways, whose one-year term expired at the conclusion of the Association"™s 69th Annual General Meeting in Cape Town. Anderson has spent more than 25 years in aviation. He was named Delta chief executive in 2007 when he joined the airline from United Health Group. He began his aviation career in 1987 at Continental Airlines. In 1990, he started a 14-year career at Northwest Airlines, where he served as chief executive from 2001 to 2004. Air Canada president and chief executive Calin Rovinescu will serve as chairman from June 2014 following Anderson"™s term and the conclusion of the Doha event. Strong calls for African governments to take full advantage of aviation as a catalyst for growth and development were heard during the Cape Town event last year. 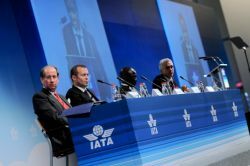 Opening the conference, IATA director general Tony Tyler said: "Nowhere is the potential for aviation greater than on the African continent – the home to a billion people spread across 20 per cent of the world"™s land mass. "The 50th anniversary of the African Union reminds us of its vision for an integrated, prosperous and peaceful Africa, driven by its own citizens and representing a dynamic force in the global arena. "Aviation is well placed to contribute to these and the other long-term goals so vital to the development of Africa," he added.